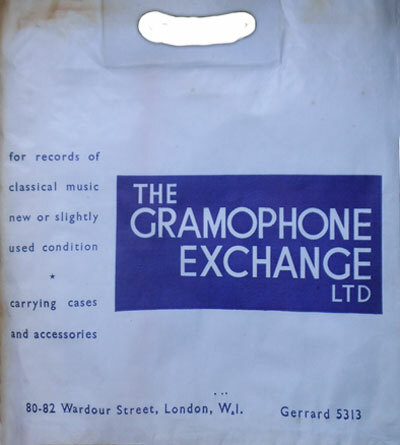 Before Gramex, there was Gramophone Exchange. Here's an anecdote about recording-buying in 1940s from www.st33.wordpress.com. The final paragraph mentions Roger and the establishment of Gramex in Waterloo. “We bought for good, for ever, musically and technically. We had to look around, to search through piles of secondhand and deleted records. But we had far more specialist shops and far more fun, tiring and headache-making though it was. Very good geographically too, finding out where all the back streets were, panhandling along our cobbled Klondike. In 1940, my regular record gathering programme commenced with the purchase of a 1s. 6d. return workman’s ticket very early on a Saturday morning. Then there followed a day of record (listening) before returning with, usually, two new discs, carefully chosen after hearing as many as I thought I could get away with, and still be welcome in the same shops the following week. Arriving at Charing Cross from Kent before 8 a.m., so that the ticket was still legal, one walked everywhere. 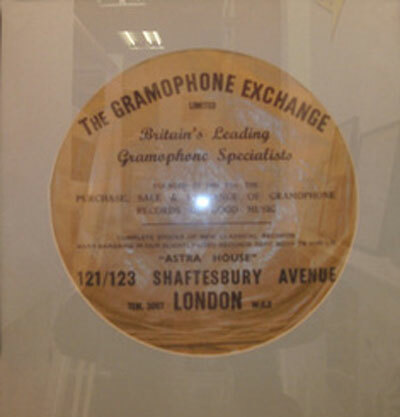 First of all up to the old and great Gramophone Exchange, at that time in large premises on two floors in upper Shaftesbury Avenue. At one time the main, ground floor was for new records, the basement for secondhand, but the two got mixed up over the years. ‘Pop’ Russell ran it and tall Bill Snow sat by the window behind the counter. Some years later they moved to Wardour Street which I never liked so much. We were reluctant to take records in for sale to stern looking Mr Russell. At the far end of the earlier shop were those listening booths, musical retreats we all loved so much (except when other people opened the door with the same inquiry you got in phone booths). For each record I intended to buy I reckoned to hear three. In this way much time passed, except at HMV — at that time a fine, classical shop in Oxford Street (same position as now) — where they were a bit ‘stuffy’ if you played records right through and would often insist that you didn’t. Heaven for me was when I discovered the hidden EMG shop. This was tucked away in Grape Street, a small turning off Shaftesbury Avenue, so only a few yards from The Gramophone Exchange. At EMG you could only buy new discs, but they kept many records from the HMV and Columbia Special List and other foreign lists (notably the German and Italian) as well and, above all, would give you advice, the assistants knowing their repertoire—and knowing they knew it! 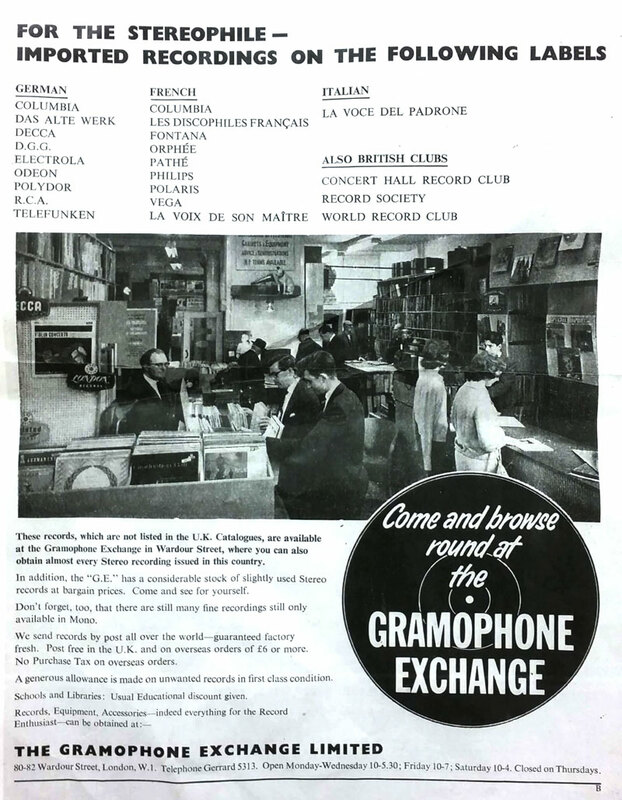 EMG had much the same booths as The Gramophone Exchange. The only snag was that the shop was so small. These two shops usually provided what I needed, but most times I would make it down to the more palatial HMV premises. All record booths, being small with doors that shut tightly to keep the noise in, were very uncomfortable after 15 minutes or so, but HMV’s were the most hazardous. Theirs had another factor, an odd, electrical sort of smell which made you feel ill. On every visit I was glad to get out and would occasionally commit the unforgivable, leaving before hearing all I wanted. The author of the above was Ronald Hastings and his reminiscences appeared in the November 1986 issue of Gramophone.